BMC FootPrints is a flexible, comprehensive, integrated IT service and asset management platform that is easy to install, use, and extend to create business value. 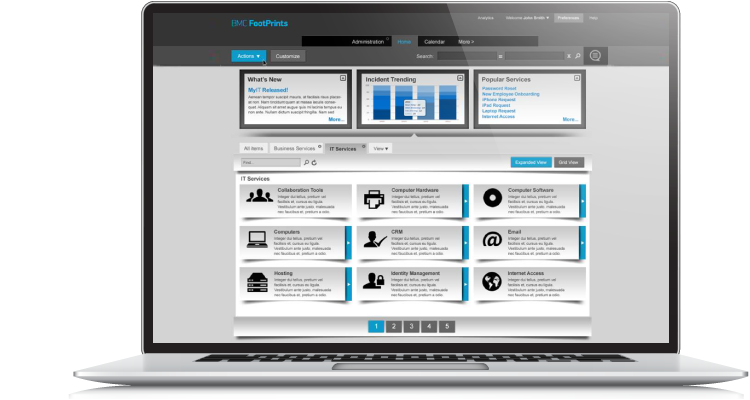 BMC FootPrints is a web-based, on-premise solution that is quick to install and easy to use. Supporting the convergence of IT service and asset management, this powerful platform gives you the visibility and control you need to continuously improve service delivery and manage IT assets while driving efficiencies, controlling costs, maintaining compliance, and reducing IT vulnerability and financial risk. With an emphatic focus on user experience, BMC FootPrints improves customer satisfaction and IT productivity, revealing the true value of IT service and support to the business. BMC FootPrints Service Core provides all of the functionality you need to manage Incident, Problems, Change and Configuration Management. The Service Catalogue provides end users with an easy method to request new services. BMC FootPrints Asset Core brings additional functionality including Asset Management, Patch Management and lots more. Read more ….